Infographic Saturday has been going for about a month now, and I’m quickly realizing an unintentional theme: Agreement isn’t necessary. I use this space to share an infographic that taught me something new or inspired a reaction. Lately, that reaction has been… Eh? It’s kinda worthless. There, I said it. I’m not piling on you here, Lori. You’re awesome. It’s just that this is a popular link bait category (look, I’m participating now, too!) and the results rarely have much value. To be fair to Lori, this comes straight out of a Mashable report conducted by bit.ly. You following? These two reports completely contradict one another. Granted, Zarella uses “percentages” instead of raw totals, but the conclusions are clear opposites. Lori and bit.ly say to post between 1 and 4 pm while avoiding posting after 8 pm and the weekends; Zarella says the highest success is after 6 pm and on the weekends. Here’s my problem with bit.ly’s report (I’ll stop assigning blame to Lori here, she’s just reporting what she read): Their conclusions are based on peak and non-peak times. They suggest that you share content when everyone else is on and avoid when they aren’t. Maybe that seems logical, but it’s wrong. I don’t necessarily care when everyone else is on. I don’t want to compete with the firehose of information that is coming in during those times. I’m most concerned about getting the most likes, replies, shares and overall engagement that I can get. You see, simply having a lot of people out there does not necessarily guarantee more engagement. Sometimes having less competition (like in the evenings and on the weekends) will actually give you a better chance of reaching more fans. You probably think I prefer Zarella’s report. Sure, I do. But I think they’re both crap in the end. All joking aside, it depends. Who are you? Where are you? What’s your industry? Where is your audience? When are they online? Most of these studies survey hundreds or thousands of Pages to come to their conclusions. But this is a mishmash of geographies that are bound to have very different results. A business whose audience is only in Australia is bound to have a different peak time to post than a business in New York City. That’s obvious, but unfortunately people still take this stuff as gospel. These reports are fun for entertainment purposes, but only you know the best time to post. Wait, you don’t? You’re reading those posts and this one because you want us to tell you? Well, you’re failing. Check out your Facebook Insights. From there, find the posts that generated the most engagement over a three month period. Find the posts that had the greatest reach. 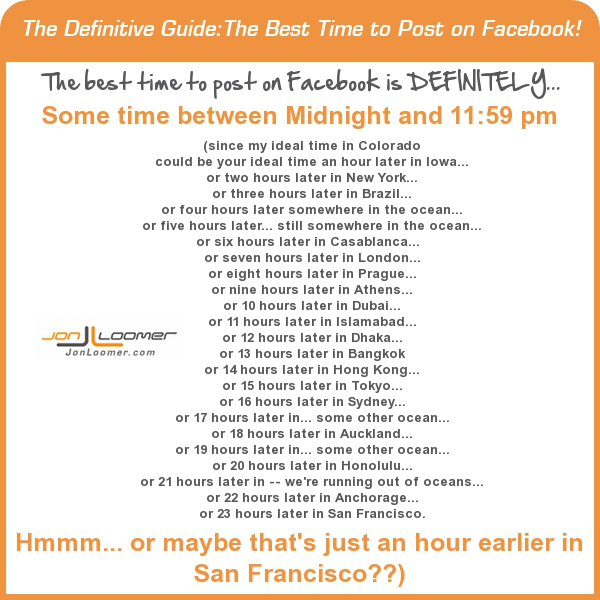 Then you will know the best time and days to post that are relevant to you. Me? I have an international audience. I tend to see results before 10 am EST, between 2-4 pm EST and later at night. I’ve even scheduled content in the middle of the night that has received response. So check it out (the original post is here). What do you think? Share your thoughts in the comments below!